I have been desperate for a Vietnamese place to pop up near me for aeons. I work in Holborn and there are more Japanese joints than you could shake a stick at, but no sign of Vinafood save Pho on St John Street, which is just that little bit too far for me to make a lunch hour trip. So when the Grubworm informed me that Potemkin at the end of Leather Lane had turned into Cafe VN, I was almost shaking with excitement (yes, I'm a food nerd). I don't know how I'd missed this, as he himself calls me Foodie Central and I traipse down Leather Lane at least twice a week. We organised a meet-up with several others for that Friday and I waited. 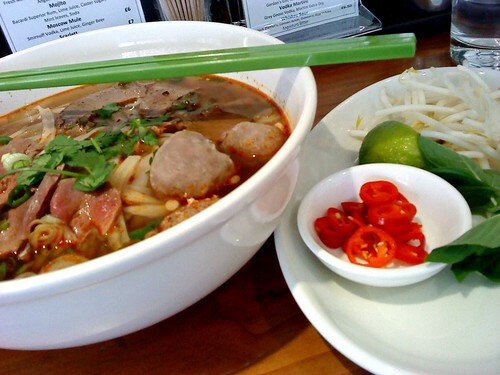 And then on Thursday, overwhelmed with pho cravings, I stopped waiting and ran down to Cafe VN by myself. Actually ran, and I never run. First impression was that I'd wandered into a trendy staff canteen. Everything was bright, shiny, plasticky white and green, and faintly painful-looking as if to encourage you not to linger. And to add to my discomfort, there was no room at the inn, so I was forced to perch awkwardly on a high stool at the bar. I felt a bit foolish, as the bar was clearly not meant for sitting at, being narrow and covered in spare menus and cruets. But I was hungry and wanted my pho. I ordered the prawn summer rolls (aka goi cuon) and the beef special pho, spicy, and asked for it to come together. While I waited, I studied the cocktail menu - surprisingly extensive considering this wouldn't be the obvious venue for a person to spend a louche evening. 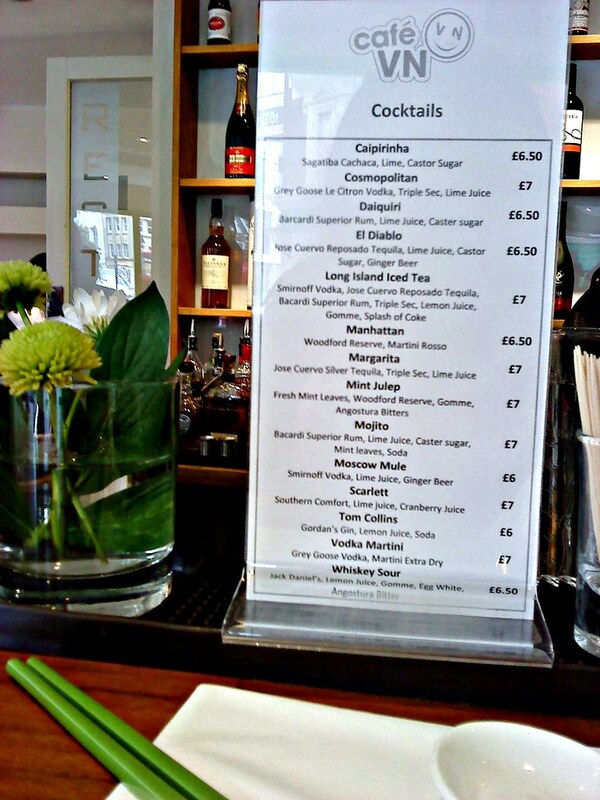 The food arrived very promptly though, which put paid to me ordering a sneaky lunchtime Long Island Iced Tea. The waiter apologised that the summer rolls had surfaced with the pho and then seemed incredulous that I had indeed asked for their simultaneous arrival. 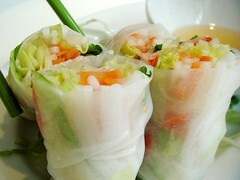 To my joy, the summer rolls came with my favourite nuoc cham rather than peanutty hoisin which I find too sickly sweet. And the rolls themselves were well-made - fatly stuffed with prawns and pleasingly stretchy noodles. Fresh and fabulous (if a little herb-deficient), they slipped down my throat worryingly fast. The beef special pho also hit the spot, with a deep, spicy stock, those stretchy noodles, bouncy beef balls and a generous scattering of raw beef slices. Again however, the herb portion was stingy - I would have killed for a handful of coriander. And oh - the sliced chilli rings had no heat at all and instead tasted sweet and fruity like red pepper. As I bent over the bar to trough the broth, I realised my awkward seating arrangement (and excitement) was causing me to flick soup everywhere, but thankfully I was done in no time at all, and could surreptitiously wipe the counter down with some napkins before anyone could see. 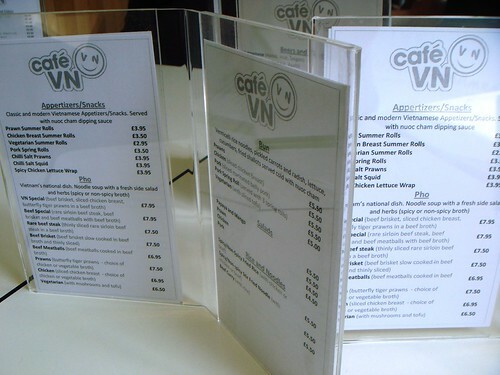 Sated, I asked for the bill and merrily waved a printout from Cafe VN's Facebook page entitling me to 20% off my meal. The waitress looked delighted and said to me "Do you play games?". Flummoxed, I said "Do you mean like Farmville?". She replied "Oh yes - I need more neighbours!" and then her colleague came up to her and said "You're not scaring our customers away talking about Farmville again, are you?". Abashed, she dashed off to get my bill - I paid, said I'd be back and left with a grin on my face. So the next day, I happily returned with the foodie posse. This time we ordered the veg summer rolls as well as the prawn, the spicy squid, the papaya and mango salad, and the porky bun cha for our mains. Drinks were more entertaining this time around. 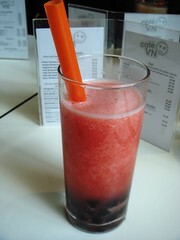 I ordered the watermelon bubble tea which was a zingy delight of freshly blitzed watermelon and chewy sago balls. A friend ordered artichoke tea which I adore though I think she was less impressed. The veg summer rolls were a bit blah - shredded carrot and rice noodles does not a taste sensation make, even if dipped in that sweet nuoc cham. Yes, I missed having a prawny element. The squid was fantastic though - wonderfully crisp batter, tender squid and an umami-rich sprinkling of stir-fried and caramelised garlic chips, chillies and spring onions. The papaya and mango salad was a massive disappointment though. Devoid of any flavour, chomping the squeaky, julienned veg was like gnawing cable ties, providing nothing but texture and empty promises. Pretty though. Things looked up slightly with the mains. The bun cha had quality ingredients with beautifully elastic, thick, fat bun noodles and well-flavoured (if sadly unsmoky) grilled belly pork. But the dressing lacked any kind of punch, and I ended up scraping the squid's leftover garlicky garnish into my noodles in an attempt to liven up the dish. Talking of dishes, the crockery is incredibly cool - the bun cha bowls resemble Eero Arnio's Ball Chair. 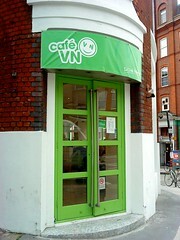 So an uneven start for Cafe VN. It's fairly priced and I'd definitely return for the pho and the summer rolls (though I'd be tempted to smuggle in my own chillies), but I'd give the salad and the bun cha a miss in future. Unless I felt the urge to steal one of those gorgeous bowls. AHHHH! I love the bun at Cafe VN! 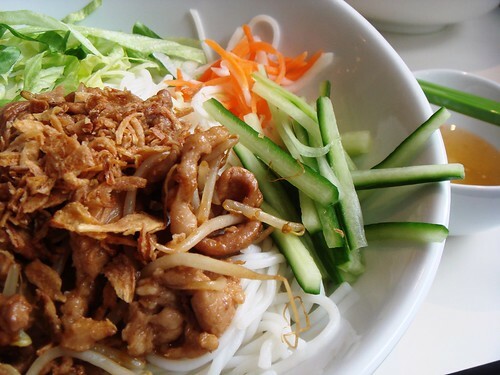 Look at the squidy noodles, they use the squidgy noodles :) Cafe VN has definitely propelled itself to becoming my fave Viet haunt in London and I've only been twice. Must go again very soon! Brilliant. Will definitely check this out as it's quite close to work. Shame about the herb portion though. I mean, it's just essential to have masses of herbs and a runny nose from super hot chilli. Essential! I love those noodles, probably more than anything that comes on top of them. They are moorishly toothsome. I love that I am not the only scoff-a-broth messy eater around, although you seem to have developed a VERY subtle napkin action to hide the detritus. Overall, i though the food lacked a little oomph, but was fresh and tasty, which at the price, and for the location, is pretty good. 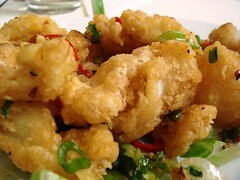 Sounds like a mixed bag Mimi, but worth a visit on the grounds of that salt squid pic alone - yum. Loved your cable ties simile, good write up. 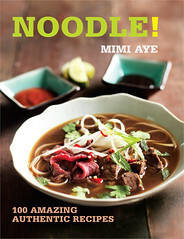 @catty - I dunno if we had a bad batch of bun - it just needed more oomph - but yes, the squidgy noodles are brilliant. @Helen - Well, exactly - I like to have a herb garden and little fiery scuds. I don't think I could have handed the disappointment of the papaya salad. Papaya salad ought to be the zingiest thing out...The squid sounded good though, maybe they're just getting their sea legs, will have to try when next in London. @sasasunakku - It's true - we left a third of the salad - it was so sad. 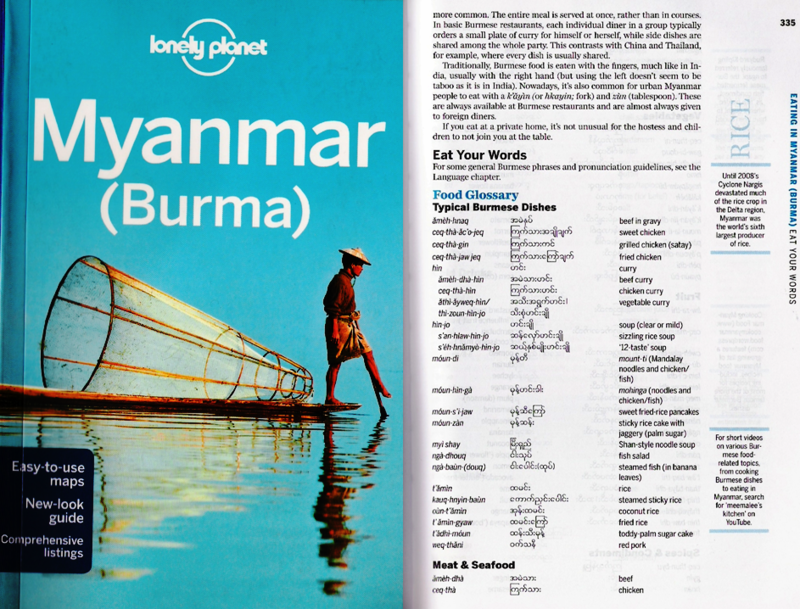 You're probably right about their sea legs - they are in their infancy so I will definitely go back. @chumbles - Thanks chumbles! Yes, the Rick Stein series was surprisingly good. @Steve Jackson - Awesome - I'm holding you to that one! 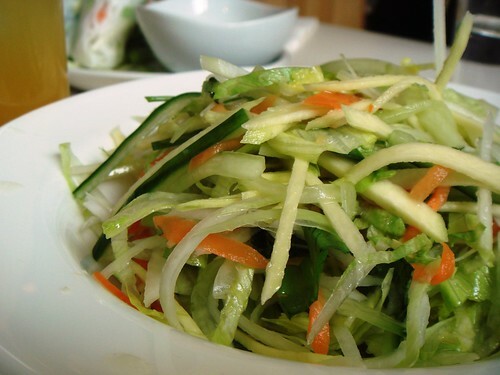 Papaya salad is one of my favourite dishes so it's a shame they ballsed that up. Love the Farmville anecdote! Made me grin too. 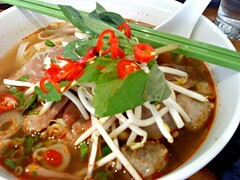 @Lizzie - I hear Pho does a surprisingly good papaya salad so I will have to make the effort to get out there. Hi MiMi, Mary here (met last night). When did this happen?! Yay! Pho is possibly the worst Vietnamese food I've ever had. Pity VN don't make bánh mì, otherwise I'd probably be there everyday. Hi Mary! Do you mean Pho, the restaurant? Still yet to try it. As for bánh mì - a new place is opening on Theobalds Road called Bánh Mì Bay so I'm dead excited!